Residents of the northern Yerushalayim neighborhood of N’vei Yaakov are more than frustrated. All attempts to find a suitable location for a temporary shul have been met by refusal from Jerusalem City Hall, resulting in the closing of the shuls. One idea from one of the regular mispalalim is to place a caravan home on a truck, which is permitting to park anywhere in the neighborhood. Therefore, they are not required to request a city permit as they struggle to permit a minyan in their area until such time a shul is built. The truck will move once in three months, in compliance with the law, thereby providing residents with a unique and hopefully acceptable solution that will not result in city inspectors coming to order them out of the area. Those involved in the effort indicate they already received halachic approval for davening in a caravan seated on the back of a truck chassis. N’vei Yaakov, as is the case with other neighborhoods in the capital, is becoming increasingly chareidi but still lacks a proper shul. There is currently an estimated 900 chareidi families in the northern Jerusalem neighborhood and yet the three minyanim are held in a school, a caravan and basement. The “main” shul is located in Talmud Torah Darkei Torah. Askanim admit they are perplexed. While City Hall admits it does not have a solution to offer, when residents found an empty structure and began using as a temporary shul, they were expelled by the city. The city decided to destroy the vacant structure even though a considerable amount of money was invested to improve it towards becoming a fitting host for a shul. Of course Neve Yaakov has a proper shul (not to mention the multitude of shuls in Neve Yaakov Mizrach). Oh wait, it isn’t a Chareidi shul… too bad. I live in Neve Yaakov, and I’m still trying to figure out which shuls were closed down, because I’m not aware of any. 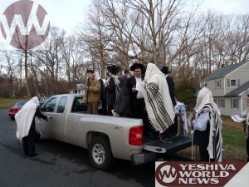 I would hope that those who think davening without a hat on is disrespectful would not countenance having a minyan on a TRUCK. That there are a significant number of Chareidim in Neve Yaakov that don’t have their own shul actually is “too bad”. But, I have some advice, which has worked in the past – let a group of Chareidim identify a nice non-Chareidi shul in a good location and decide, en masse, to daven there. Ideally they should pick a shul small enough that they can easily outnumber the existing mispallelim. Of course, everyone should be made to feel welcome but the shul will instantly take on another “tone”. And in time, as shul gabaaim and other functionaries are elected, they can put in their own people and make more formal changes. Of course this shouldn’t be necessary, since there is no reason Chareidim shouldn’t be accommodated with a shul of their own without subterfuge but evidently that’s not happening, so “too bad”, since this suggestion is perfectly legal and absolutely “democratic”. Hmmm, KeenObserver, what shul did you say you davened at again? #1,are you for real? Only your type of shul should be permitted in your neighborhood? The Sinah you demonstrate, which is likely the motivating factor in denying a Charedi shul to residents, is beyond appalling. Oh wait, I forgot…Ahavas Yisrael only extends to certain groups, and not to these repulsive black hatters. Whoops. I am absolutely for real. It is “beyond appalling” that Mr Spira apparently believes that a shul can be called “improper” because most of the congregants have jobs and support the State. i really do not understand the issue ‘separate shuls’for haraidim . i “do” understand separate chaddish/ litvish or ashkanazi/ sephardi because there is a different NUSACH can somebody help me with this? keenobserver; i know mr. spira, and it just happens to be that he supports the state probably more than you. do some homework. find out who he is. dont assume anything. I’m sure he does, because I don’t particularly support the State. However, I see no reason why the residents of the “Mitchareid” in Neve Yaakov can’t daven in the Dati Le’umi shul. Not to mention that much of the area is close to the shuls in Neve Yaakov Mizrach such as Magen Avrahom, etc. I live in Neve Yaakov and do not know what you are referring to, can you please be more specific – if these facts are not true, you are just generating hateful letters for no reason.